NTR Kathanayakudu and Yatra Collective Share Rs.30 Crores? NTR Kathanayakudu and Yatra's Share Rs.30 Crores! While TDP's loyalists consider late Ntr as the legendary personality, YSRCP's loyalists feel late YS Rajasekhar Reddy as the legendary personality of Telugu states. 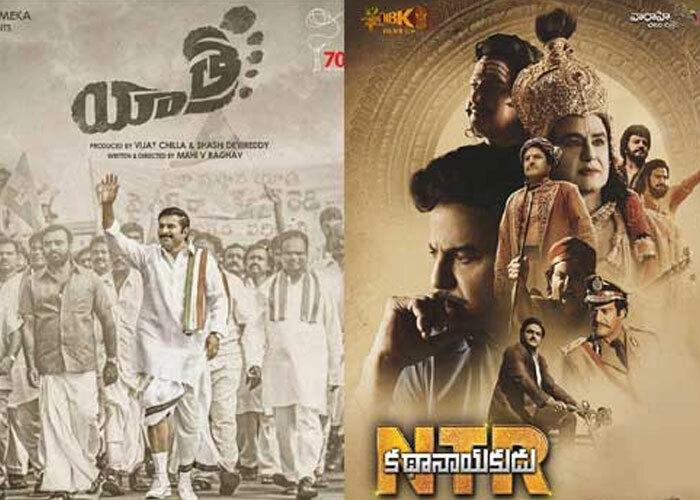 Co-incidentally, late Ntr's biopic Ntr Kathanayakudu and YSR's biopic Yatra were made simultaneously and released with a gap of four weeks. Since both Ntr and YSR were legends, it was felt the collections of both the films would abnormally be higher. Accordingly, Ntr KN had done really fabulous pre release business of Rs.72 crores. However, the film ended up as a disaster with Rs.20 crores share world wide. Yatra,which hit the screens last weekend, collected the first weekend share Rs.6 crores world wide. At this pace, the film may collect around Rs.10 crores world wide. Since the movie had done pre biz around Rs.15 crores, it will not suffer incredible losses like Ntr. Moreover, it may reach break even in some of the areas. However, what is paining everyone is that the collective share of biopics of two legendary personalities could be around Rs.30 crores in full run and which was not expected by anyone prior to the release of both the films. Ironically, Mahanati Savitri's biopic collected Rs.50 crores and scripted new history among biopics of Tollywood. Anushka Shocks with Stunning Slimness!